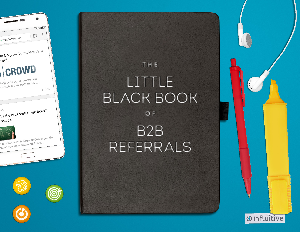 In business (and in life), the best relationships start with a referral from someone you know. However, it's not easy to put your customers in the mood to fill your sales pipeline with valuable referrals leads. You can't just barrage them with desperate emails before the end of each quarter. You need to ease your customers into the idea of opening up their Rolodexes. Whether you’re just starting to ask your customers for referrals, or have already experienced some success and want to try more advanced referral marketing techniques, this eBook features a step-by-step strategy for building a referral engine that will have your customers playing Cupid for you over and over again.